Explanation and background information for the development of the training programme and the training materials on eco-driving for trolleybuse. Introduction to the training materials, the first results in terms of energy savings and feedback from the trained drivers. Final round to gather feedback on the training programme on eco-driving for trolleybuses and to discuss possible cooperation. The trainers were surprised by the energy savings potential, which amounts to approximately 10 % in test operations during the practical part of the “Train-the-Trainers” workshop. 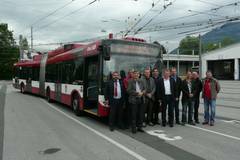 More workshops are planned for Italian and Czech trolleybus companies in future within the ACTUATE project.